“I’m single and moved here alone,” a woman in her 50s said. 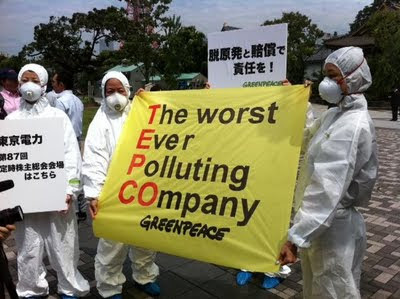 “I have been opposed to the nuclear power plant. 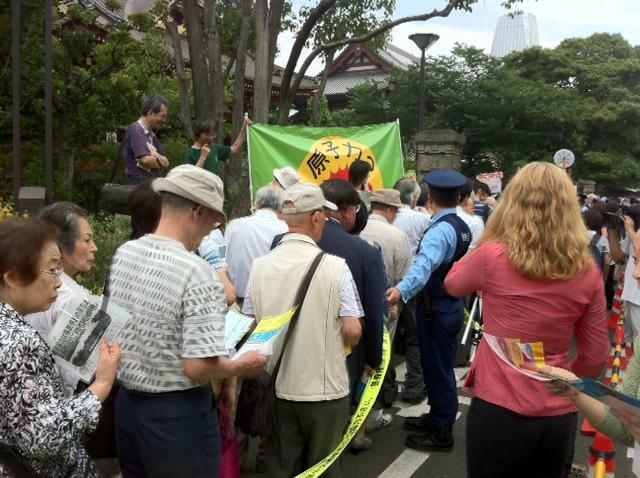 People have treated me like I was a weirdo ever since I spoke up.” The evacuee from Futaba doesn’t think that TEPCO workers make any sense. 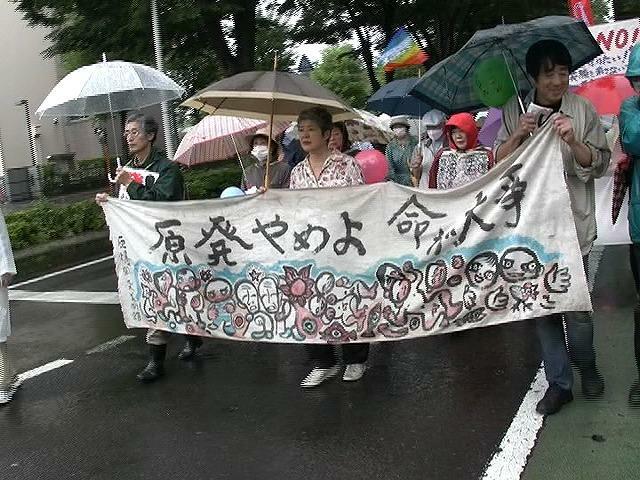 She has no choice but to stay at the evacuation center set up at former Kisai High School in Kazo City, Saitama Prefecture, because the nuclear plant shows no sign of settling any time soon and the radiation continues to spread. “I have no idea how much we will be paid for compensation. That’s why I can’t begin to look for an apartment near here,” she added. More than 50 days have passed, but she can’t yet make any decision as to whether she can even look for a job or rent an apartment. “We are in limbo; we can’t move forward,” she said. “People in Kazo City are even offering some farmland, but it takes time to get a feel for the new soil and new land before we can grow anything.” By Yumi Eto *Photo: Actor Toshiyuki Nishida, a native of Koriyama City, Fukushima Prefecture, encourages evacuees. Journalist Takashi Uesugi spoke live on Labornet TV on July 7 of the intention of the government, TEPCO and media companies to conceal and control information at the time of nuclear power plant explosion and radiation contamination. 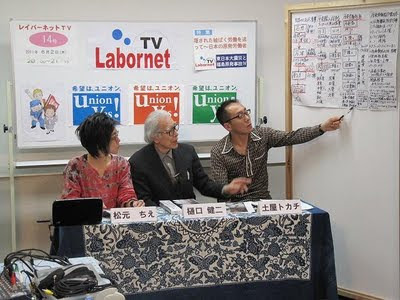 Uesugi explained on air how independent journalists pursued their right to know at TEPCO press conferences ever since March 11 and eventually led the company to talk especially by broadcasting the press conferences live. 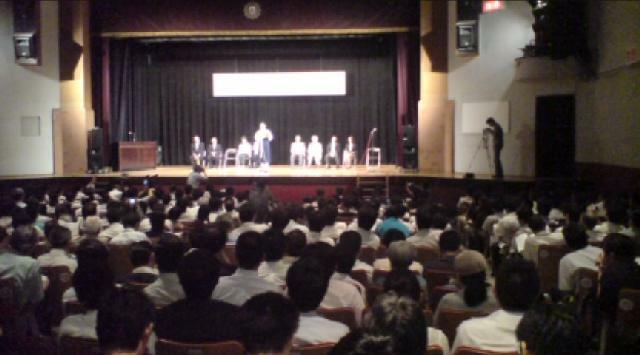 With their effort, he said that viewers learned how truth can be concealed or revealed. 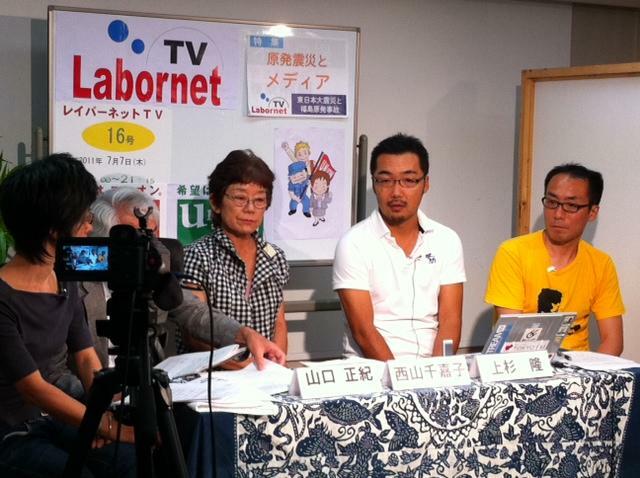 Chikako Nishiyama, a town council woman from Kawachi, Fukushima Prefecture, spoke also on Labornet TV of how she was exposed to radiation because she didn’t have enough information on how to respond to nuclear plant explosion. 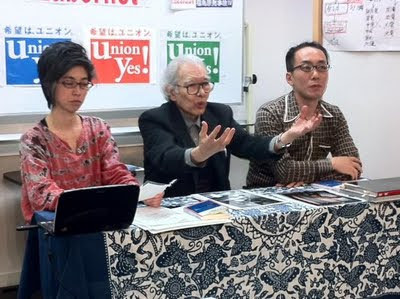 “I was exposed to radiation because I couldn’t get any information from mainstream media reports or the local government,” Nishiyama said. “I finally found useful information on the internet whereby I was able to decide what’s best to do at the time. I can’t imagine a life without internet any more.” The total viewers of July 7 program on Labornet TV reached 2,400. By M. See archive (94 min). 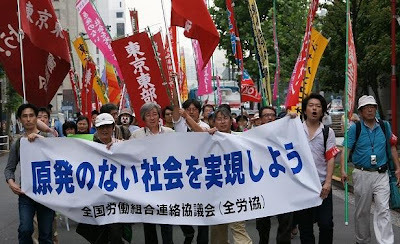 Workers at a Japanese style bar “Aji-no-Kurahachi” joined a Freeta Union after their employer failed to pay their wages and they were stranded for money. They began running the business, located in western Tokyo, on their own in March. The members were left with just enough money for commuting to work in February. 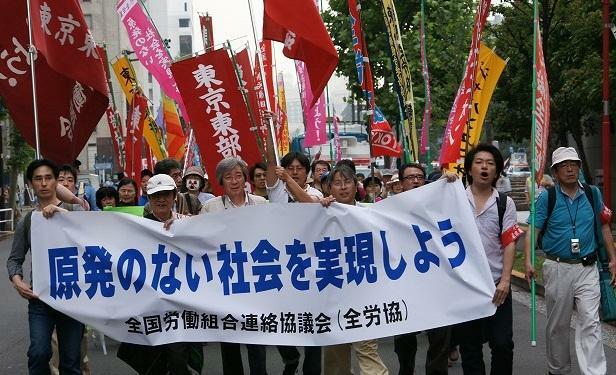 “We finally feel like we saved our sinking boat to reach a harbor,” Seiji Ishizaki, a union branch representative, said. Some 20,000 people participated in “A Rally to Call for Zero Nuclear Plant” on July 2. The rally held in Tokyo’s Meiji Park was called for by Ikuro Anzai, Tetsuya Iida, Etsuko Ichihara, Toshie Negishi, Shuntaro Hida, Reiko Yukawa, as well as Actress Sayuri Yoshinaga. More than 70 farmers from Japan Family Farmers Movement “Nominren” of Fukushima Prefecture joined and called for support. Japan Communist Party Chairman Kazuo Shii addressed to the rally before the message from Social Democratic Party of Japan Chair Mizuho Fukushima was read out. We hope that the politicians and the people of Japan would join hands in the anti-nuclear plant movement beyond their political boundaries and ideologies. 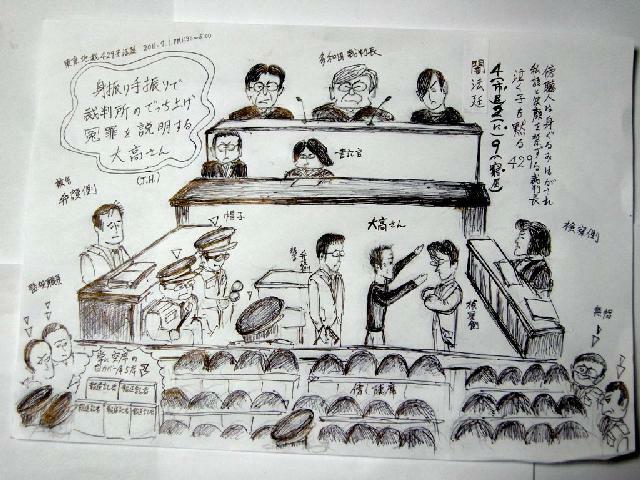 By K. See UStream video by JCJ. Can Court Order People to Leave for Bringing in Mobile Phones? 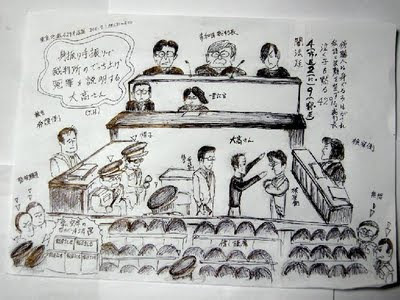 Judge Tawada at Tokyo District Court opened a hearing for Shoji Otaka’s case by announcing that he would order people to leave the courtroom if they made any irregular statement or laughed. 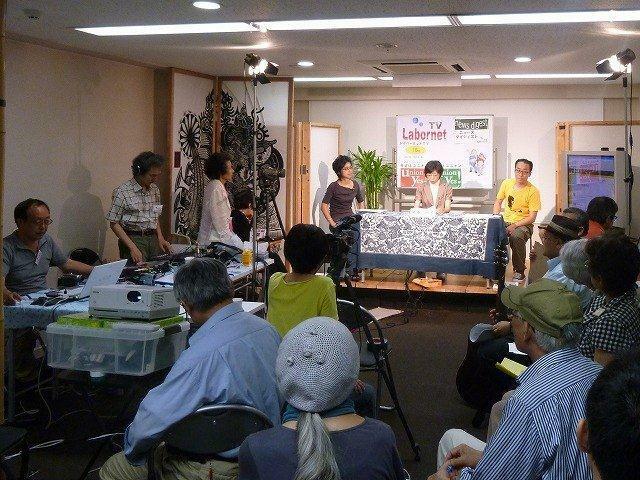 The five seats allocated for reporters remained unoccupied on July 1. Photo: MATSUMOTO Chie, confronted by union staff, asks for interview. 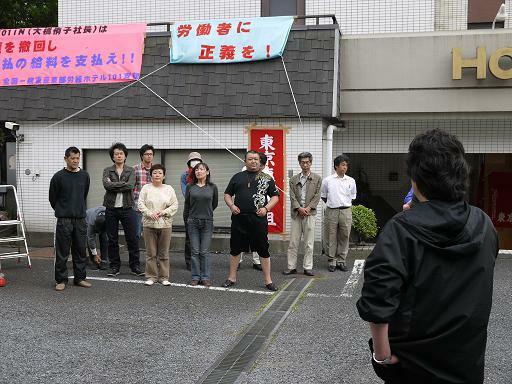 Workers at Hotel 101 Inn in eastern Tokyo formed a union under The National Union of General Workers Tokyo Tobu on May 23 to demand that the company annul dismissals due to business closure and make unpaid wages. 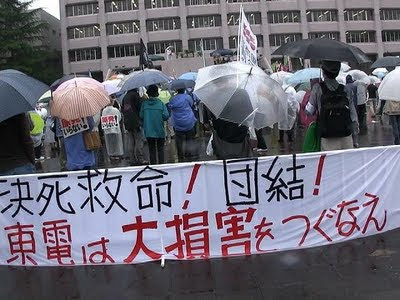 Computer monitoring bill is about to be forcibly passed amidst earthquake, tsunami and nuclear power plants disasters. This dangerous bill would allow police or court to monitor communication history on anyone’s internet without a warrant. It would deprive us of free exchange of information via internet and lead to restriction of expression. The upper house passed the bill only within a few hours of discussion at the end of May, and the upper house was to start discussion on June 7 to vote on it. The parliament aims to quickly pass and establish the legislation. We need to inform the public of its danger and raise our voices. (By M) View HP, photo of a panel discussion on May 9. 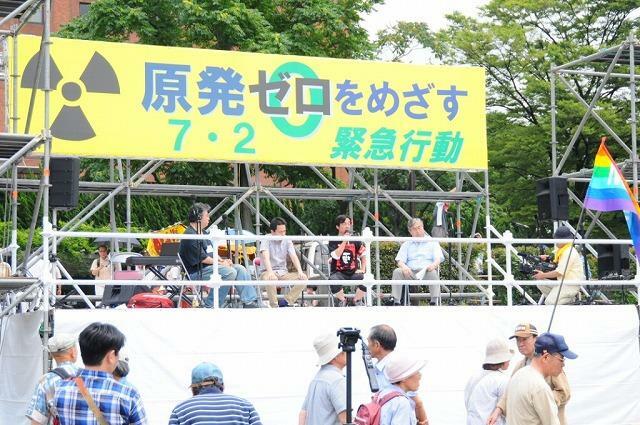 ※The bill passed the upper house on June 17 and is to be enacted in July. 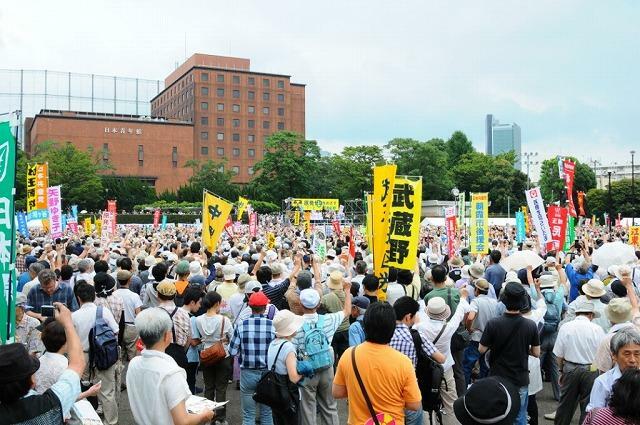 Osaka Prefectural Assembly passed the “Kimigayo” ordinance, and it was enacted on June 3. 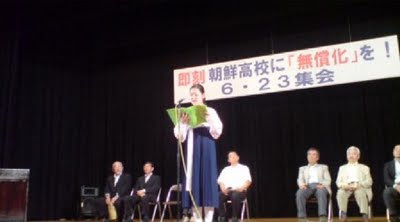 The ordinance is to demand teachers of prefectural schools stand for the national anthem, known as Kimigayo. 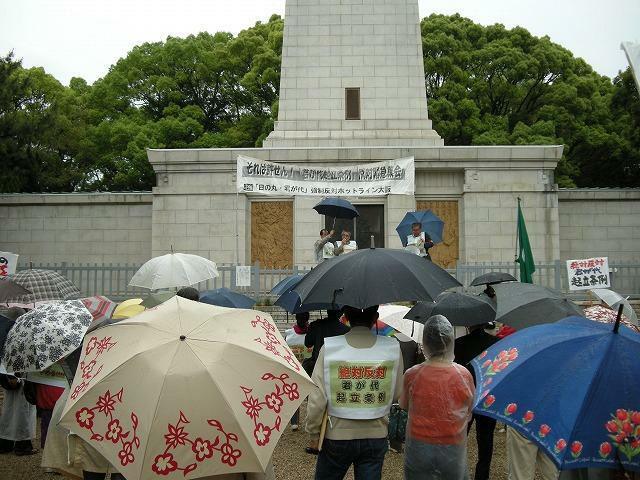 A citizens’ group released a protest letter to the local government, which said the reprimanding teachers who refuse to stand for and sing the national anthem, as well as threatening them by it, obstruct children’s right to know a diverse sense of value in society and people’s right to form their own personality. Treating teachers who refuse to stand up for the national anthem and reprimanding them would also hurt children. They would end up not making their own decisions and learning not to protest authorities without respecting their own ideas. 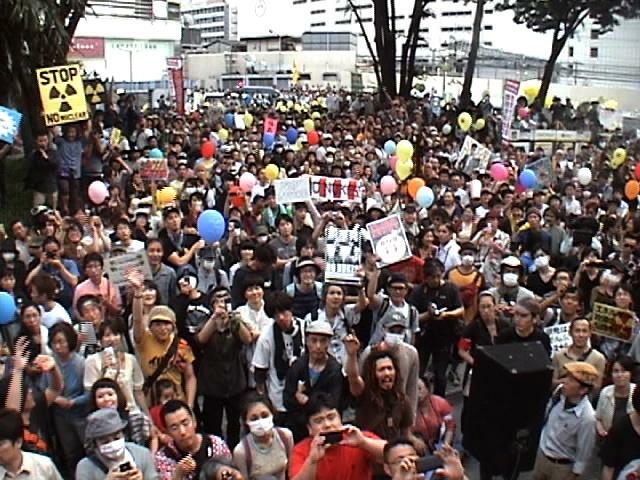 The group announced that it would expand the protest action. 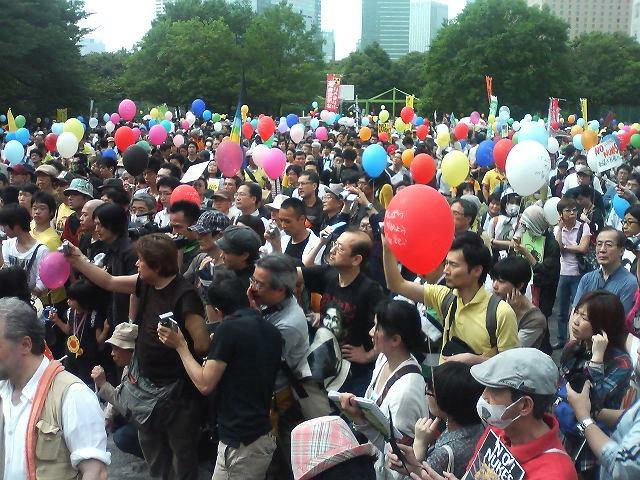 Photo: rally held on May 26.